Guess I should have posted here <b>before</b> posting my Sumerian stuff! Elsewhere I’m Ithoriel so you may recognise me as that from other forums. As to interests, 1/3000th to 54mm scale land, sea, air and space, dinosaurs to death stars about covers it in a nutshell. TWW is already one of my “must read” wargames sites. My “other” forum is WD3 http://www.wd3.org.uk/index.php Possibly the best & most active small forum out there. But this place still feels like home, new though I am. Can I ask a favour of some of you please? TWW relies on the paid membership of the Trader Members and the Sponsoring Members to both keep TWW running and pay me a minuscule wage (like that minuscule violin you can now hear) , so if any of you have adblocker running, please consider allowing it to run on here, as the adverts are one of the features that attracts the Trader members, and without them there would be no TWW. Like I say don’t feel obliged but it may help and you may see a swanky ad for something nifty. oh, and big up to you all for making TWW a pleasant place to be. The ads, by the way, just make TWW more pleasant (I mean it!) because they’re all hobby-related and all from the sort of loveable little “grassroots level” companies that are the true heart and soul of the hobby. And in no way intrusive – I’m saying that as someone who uses a laptop with a small screen. Second that – the ads are not intrusive and very informative. They don’t slow loading down (in fact when I was running adblocker that slowed loading down more!) I was glad to turn it off for this site. Thanks to all the new people for signing up and to the older ones that have come back. I hope you enjoy what we have to offer and remember, be excellent to each other! Just posting to say hi. After the unpleasantness elsewhere last weekend it seemed a good idea to support TWW more than I had been doing. Cheers very much, be cool and have fun. All gaming all the time !!! Unpleasantness? What have I missed? This place serves as a great insulation from elsewhere’s nastinesses. crestabear wrote: Just posting to say hi. After the unpleasantness elsewhere last weekend it seemed a good idea to support TWW more than I had been doing. Unpleasantness? What have I missed? This place serves as a great insulation from elsewhere’s nastinesses. I would rather that not be discussed here, by all means discuss it, just ‘offline’ if that is OK? Apologies, Mike, didn’t mean to start a discussion on that. This reply was modified 1 year, 11 months ago by crestabear. Hi All, My name is OB. I’m interested mainly in Ancients and Colonials but do other stuff to all in 15mm. I do have a blog where I write about toys and history as you might expect. My current enthusiasms include Piquet and Dan Mersey’s recent rule sets. Don’t think I’ve ever introduced myself on here before. Story of my life, and a peril of being an introvert! Hi, I’m Ruarigh. My day job is Vikings, and my main interest in wargaming is early medieval or anything Scandinavian, but I seem to spend way more time playing Gruntz, Laserburn and Imperial Commander instead. I’ve also been running the Talomir Tales fantasy campaign since 2009 (http://talomir.blogspot.co.uk/). Crestabear, that is one great avatar! Brought back some memories – I was allowed to keep the 2 bob deposit for taking the bottles back to the shop (remember that, recycling before we knew what it was – why don’t we do it now!?). Anything not spent on sweets went into my model and ‘Airfix soldier’ fund for the weekly trip to Elm Park Hobby Shop. Greetings! My name is Jeff and I’ve been doinking around with miniatures since the mid 1970s. I’ve dabbled in many periods and scales from 25mm Aztecs to 54mm Zulus; from 1/600 ACW ships to 1/144 WWI aircraft. While 25mm ancients are my first love I’ve played almost no games in period. I’ve tinkered with rule writing (ancient galleys, ACW ironclads, Spanish-American War, Aztecs and finally gladiators. All available here: https://sites.google.com/site/petiteguerre/home/ ). I blogged for a while (http://petiteguerre.blogspot.com/) but my mojo for that has flagged. I must admit my hobbies have been very dormant for the past five years. Practically moribund. But over those years I’ve changed from being an unhappy IT contractor to working in the historic site/museum field. Not nearly the discretionary funds I had earlier in life but the career change almost makes up for that. But you know gamers… we never really retreat from the field. We just strategically withdraw. I’m thinking some solo gaming may be in my near future. I’m all set to try Longstreet Lite in a solo game. I’m liking the 54mm plastics scene (They’re big enough that I can paint ’em. Well, almost. I recently discovered that a lighted magnification visor does wonders!) And I have to admit, the community here seems quite on-topic and pleasant. I tend to be a slow gamer, not very communicative and somewhat reclusive. So my real reason for posting an introduction: How does one search the fora here? 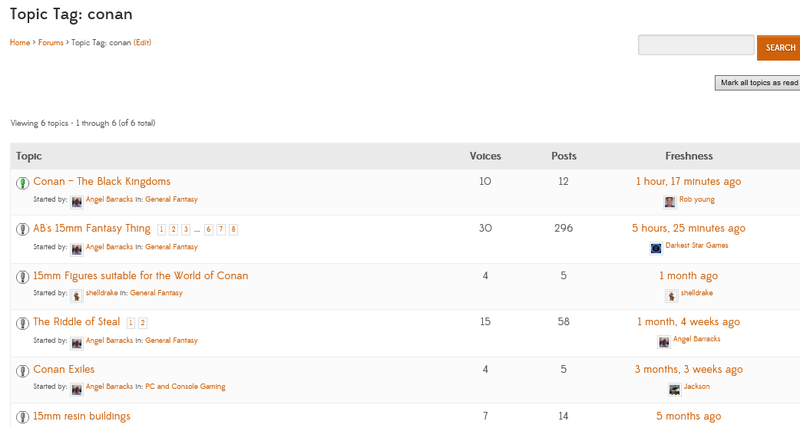 But also, topics have TAGs and you can click a tag and it will show all topics that also have that TAG. Thanks, Mike. 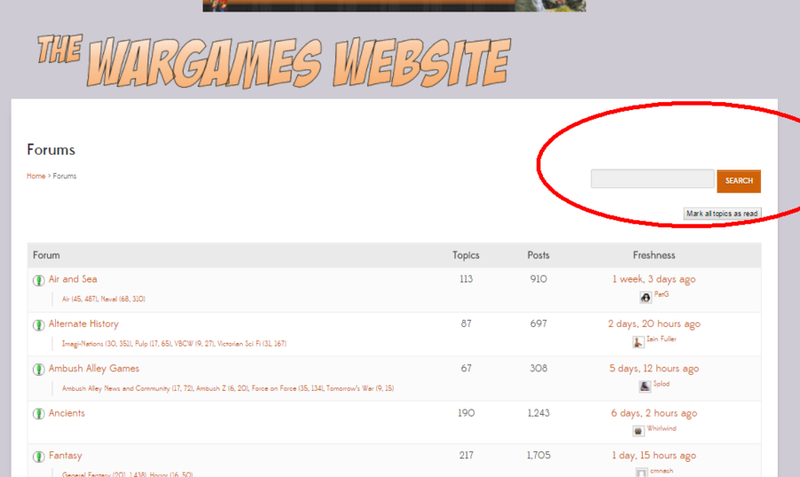 So it appears to me that the search box is only available at the top level of the forum, or if you have clicked on a tag? If I drill down into posts I don’t have the search box on the page (I guess it’s replaced by the tag link?). That seems odd to me but maybe it’s the way the forum software is designed. Hello everybody! I am Tom, in my 30s, and have been gaming since the mid-90s or thereabouts. In reality I am more of a collector/hobbyist than a gamer, partly due to absence of opponents and lassitude in seeking them out, and partly because I have such difficulty sticking to one project for long enough to get a game-worthy army out of it. About a year ago I decided to change my ways and focus on one project for a while, and that met with moderate success, though inevitably I’ve quickly sprawled out into other areas again. My current interests are in 28mm ancients, 6mm English Civil War and 1/2400 Anglo-Dutch Wars, and have actually managed to make some reasonable headway with all of them, thankfully. I also have an interest in some skirmish games like Blood Bowl and Freebooter’s Fate, and I have an awful lot of Warhammer stuff from days of old that I’m trying to work out whether to sell or rescue. I made my way over here after being purged from TMP, and having heard that this was a nicer and more reasonable forum. I might not be around all that much but I hope to be able to contribute something useful once in a while. Welcome Tom ! Post when you can on what you like. Anglo Dutch Naval you say … tell me more please. I already read your blog and good to see you here anyway. I’ve been doing AWI and Napoleonic sail in 1/2400. I’m really looking forward to hearing about your 1/2400 Anglo-Dutch. Never wrestle with a pig. You both get muddy and the pig just likes it. My is Jeff and I’m new to this forum. 6mm sci fi and 15mm fantasy are sort of the areas I’m interested in… right now the only game I’m playing sort of regularly is Battletech Alpha Strike but, it’s not ideal for me because for sci fi 6mm, it treats infantry horribly… and I love infantry. 😀 Anyhow, this forum looks like it’s full of awesome wargaming eye candy… can’t wait to dive it! This reply was modified 1 year, 10 months ago by Jeffrey Garrison. "This is my forum signature, there are many like it, but this one is mine." Welcome Jeff, lots of good war game stuff here. Hello, my name is Thomas J. Moore. Let’s just say that there is some disillusionment with the “Other Forum” and loss of good people. I see from posts here that there are a lot of familiar names. I started gaming at 15 back in 1973 using WW2 micro armor on the floor. I was in the Royal Canadian Sea Cadets for 5 years and spent a summer on the HMCS Columbia at the age of 15. I subsequently joined the RCN Reserve and served another 2 years as a signalman. In my younger years I played 6mm Napoleonics and Airfix ACW, and a member of the Trumpeter Gaming Club for many years. Approximately 20+ years ago I joined the White Rock Gamers, thirteen of so of us who play every Thursday. Our games are Armati 2, Battles for Empire 2 by Chris Leach who is a member of our group, Shako 2, Fire and Fury and Rapid Fire. Between all of us we have somewhere around 300K of figures, mostly in 25/28mm. I’m glad to be here and see what others are painting and playing. Welcome Thomas, just look around and find something to post about. Hi Thomas. I’d love to hear about your Battles for Empire games as that is a rules set I’m quite curious about but have never seen played. While I have not played Armati 2 for several years, my friend and I used to always get in a game or 2 a year for about 10 years. So it is always good to here is is still played elsewhere. It is my favourite ancients set of rules. Long time no see, since you left TMP. Nice to reacquaint again. Battles for Empire is a good solid set of rules, that are well and clearly written. They are a tad long, only to cover things that gamers will do on the table. Over the years we’ve played many games, only two weeks ago we played Isandlwana. Guess what, the British lost…again. The scenario is designed so that the British can win providing they destroy a set number of Zulu units. Colonial troops are regulars or second rate with different firing characteristics. Units are usually 12 figures 3 to a stand. Zulus, would be 12 figures, 6 each on two stands. Chris has rules for Boxer rebellion, Pathans, Zulus, and Boer War. Each unit takes 8 hits with reduction in firepower and morale when units get below 50%. Each unit or group of units rolls on a movement chart with plus’s and minus’s for being staggered or disordered, low on ammo, attached leader, army leader within range etc. This roll determines how much movement you have or sometimes retreat or surrender. Artillery and MG’s are included each with varying firing characteristics. Chris has been working on a WW1 suppliment with my help. It’s a great game with lots of possibilities for scenarios. Yes, we play Armati 2 probably 30 to 40 times a year. Our group has over 30 different armies from Biblicals to Renaissance. I myself have a Greek Hoplite army, and Burgundians late medieval, early Renaissance. I have some extra units of pike for them and some Landsknechts so I can use this army for a later French one. In the lead pile is a late Roman army that is up after these. Thanks for the welcome Kyoteblue, nice to see you here. Yikes and egads! Oh no! The Illudium-PU-36 Space Modulator! He brought the Illudiun-PU-36 Space Modulator. He brought it here! We’re all going to disappear in a ka-boom; an Earth shattering ka-boom! Woe is upon us! Hello Thomas Moore and welcome aboard. I hope that after just over 500 years of searching you have finally found your “Utopia”! Gotta love that 15th/16th Century humour! An Ancient gamer who plays WWII as well and a fellow Canuck. Outstanding! Thanks for the welcome Rod, another one I used to see in the lounge! Yes, I use him for my signature on various forms along with wrgmr1. That way gamers will recognize me. Ha! My favorite character from Bugs Bunny is actually Foghorn Leghorn, but he’s not really a gaming type figure. What part of our beloved country are you in? Ontario? Hi all. Another newbie here. Heard about the place on TMP a couple of months back. Gaming since the mid 80s, when someone at work brought in AD&D, this led to the FASA Trek RPG, which led to a local wargames club, and the FASA Starship Combat Simulator! Mainly SF thru the FASA games I usually played, although I’ve also played Full Thrust, Battletech (original and the Clix version too), and occasional tried a game or two of other periods for a change, although never followed up any interest on them. So SF it is! Although I don’t get to play these days, still painting up starship minis on occasion too! Still looking around the place, glad to be here. "Fool me once, shame on you. Fool me TWICE? INCOMING! " - Old Klingon proverb! Welcome. There are quite a few folks doing Trek games and even more doing spaceships in general, Just in and show us some eye candy!